Madden NFL 11, ASIN# B002I0JB6E (xBox 360), is the 22nd version of EA Sports' classic video game football franchise and available for the xBox 360, Nintendo Wii, Playstation 3, Playstation 2 and the Sony PSP. 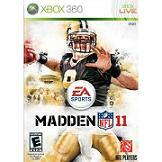 Featuring cover athlete Drew Brees, Super Bowl XLIV MVP and quarterback for the New Orleans Saints, Madden 2011 incorporates a blend of simpler, quicker and deeper new features with time-tested classic features expected from a game in the Madden franchise. Features that are included in the Xbox 360 version: Franchise mode, All-new GameFlow playcall system, dual stick control, extensive online functionality and more. Madden 11, also sometimes called Madden 2011, redefines the way you experience the game of football. Simpler: from 350 plays down to 1, the all-new GameFlow system puts you in the helmet of an NFL quarterback, to execute an authentic, situational game plan, one play at a time. Quicker: with 60-minute game times reduced to 30, spend more time on the field and less in the playbook. Same drama, half the time. Deeper: Madden NFL 11 is feature-rich, with improved animations and control options, enhanced online functionality, and new broadcast and audio presentation that delivers the NFL experience fans have come to expect. NCAA Football 11, ASIN# B00386ZE6I (xBox 360), is the highly anticipated 2010 release in the NCAA Football franchise, returns with a focus on authenticity, innovation, and core experience. It is available for xBox 360, Playstation 3 and Playstation 2. Feel the emotion of authentic college football more than ever with NCAA Football 11. From running the ‘no-huddle’ spread offense to walking out of the tunnel locking arms, everything you do and see will be original to your favorite school. With an all-new locomotion engine and real assignment A.I., only NCAA Football 11 gives you 120 ways to win! Graphics are awesome. From the stadium turf up to the players' uniforms. The helmets are especially realistic. It does not have the cartoony look of last year's version. One of the great features of NCAA Football 11 is, that it delivers unique game play and traditions for each of the 120 schools through the TruSchool system. EA Sports always has the best football games and still doesn't let down with this new college football game. Updated rosters and gameplay can't be beat. NCAA® Football by EA SPORTS ~~PURE PASSION. TRUE INTENSITY. STUNNING VISUAL IMPACT! Designed to deliver the amazing graphic quality of the iPhone 4 Retina Display, see and feel the real college football experience. Represent the school of your choice and play with rules and plays reflecting the actual NCAA Division 1 game. Proudly lead your team to glory in the BCS National Championship! SEE WHAT THE iPHONE 4 RETINA DISPLAY BRINGS TO THE GAME With the sharpest, highest resolution phone screen ever made, see your collegiate game spring to life with color and clarity as crisp as an Autumn afternoon.ROLL WITH THE TIDE? DO THE GATOR CHOMP? HOOK ‘EM HORNS?Represent YOUR school and capture the real feel of NCAA Football! Choose from over 55 of the most popular college teams. Run the wishbone, the spread offense, and more, as you play out traditional rivalries or build your own. CREATE AND CUSTOMIZE YOUR OWN TEAM Build your own tradition! Use the NCAA Team Editor to make your own team from the ground up. Create uniforms, school colors, stadiums, player, and team names – even select your own fight song from your iTunes® playlist!BECOME THE NATIONAL CHAMPGuide your team through an entire season, and earn bids to the Rose Bowl, the Allstate Sugar Bowl, the Tostitos Fiesta Bowl, and the FedEx Orange Bowl. Or see if you’ve got that special something extra to win the BCS National Championship and be #1.CHALLENGE YOUR PERSONAL RIVALSGo head-to-head against a friendly rival via live Bluetooth Multiplayer and really represent your school! REAL BROADCAST COMMENTARY AMPS UP THE EXCITEMENT Commentary and analysis from college football experts Lee Corso and Kirk Herbstreit will give you a total sense of the game. 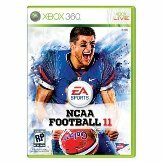 NCAA 11 vs. Madden NFL 11: NCAA 11 really captures your attention. This is the first year I'll gladly say that Madden takes a FAR back seat to it's college cousin. NCAA 11 looks better, plays better, and is much more engrossing and fun than Madden. Madden feels sterile compared to NCAA. In every area of the game, I was far more impressed with NCAA than with Madden. The only reason to buy both would be to import your NCAA draft class to Madden--but why bother when you can just play NCAA!